Twenty-one years after the start of the George Washington University (GW) Medical Faculty Associates’ (MFA) Mobile Mammography Program, supporters gathered at the Embassy of France in Washington, D.C., on Oct. 17 for the Blush Luncheon to toast a new mammovan and the future of the program. Parked outside of the embassy, the mammovan was a bright splash of pink against the white marble of the building and the cloudless blue sky. The vehicle, which makes early detection for breast cancer accessible to underserved women across the city, is outfitted with 3D mammography technology, the most comprehensive mammography system available; a spacious setting for patients; and two individual changing rooms and private waiting areas. Inside the embassy, the luncheon began with an introduction by Master of Ceremony Jennifer Griffin, national security correspondent for Fox News. A breast cancer survivor herself, Griffin told attendees about her own experience, including finding out about her diagnosis on a cool fall day in 2009, a day like the one on which the luncheon was held. “When the weather changes at this time of year, it still takes my breath away because you know that feeling of going into chemo,” Griffin said. At the time, Griffin’s two daughters were 6 and 8, and her son just 6 months old. Griffin also encouraged those in attendance to donate to the future of the mammovan through a texting campaign. The campaign is open throughout the month of October, and donations can be made by texting “Mammovan” to 40649. In addition to Griffin’s story, attendees also heard remarks from LaQuandra S. Nesbitt, MD, MPH, director of Washington, D.C.’s Department of Health, who spoke about the role the mammovan plays in the D.C. community, as well as D.C. Delegate Eleanor Holmes Norton, who noted the importance of support from Congress in helping programs like the mammovan. Griffin also sat down with celebrity guest Giuliana Rancic, the host of E! Entertainment and a breast cancer survivor, for a panel and audience discussion. Rancic, at the time of her diagnosis in 2011, was trying to have a child with her husband, Bill, but nothing was working. The couple was going through a third round of in vitro fertilization when they decided to go to a new doctor. He requested she get a mammogram, something he required of all his patients. Rancic went ahead with the screening and then had more testing after it turned up an abnormal result. “I was 36 years old … and pretty much my biggest worry the day before going to the doctor was what I was going to ask George Clooney on the red carpet,” she joked. Every patient’s treatment path is different, and Rancic said her support system helped her figure out a plan. That plan included a double lumpectomy that revealed she had cancer in both breasts. At that point, Rancic said, she and her husband sat down and had a heart to heart, making the decision to go forward with a mastectomy. “That was just over five years ago, so I’m celebrating five years cancer-free,” she said. 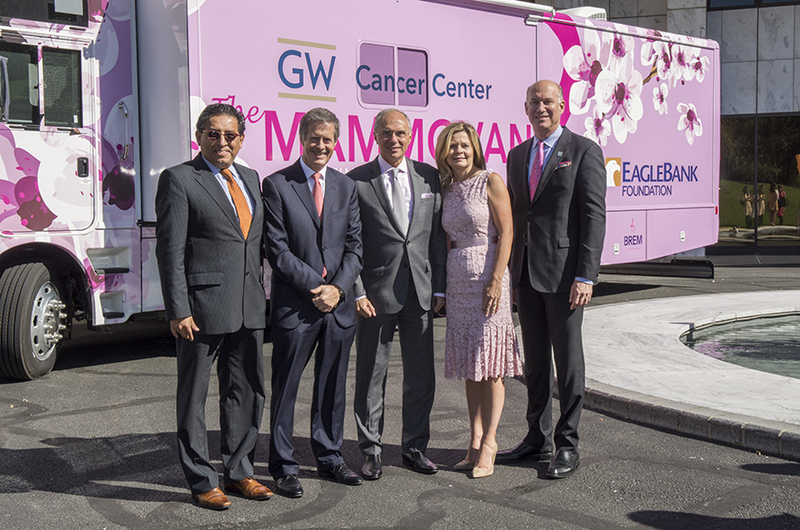 Also in attendance to toast the new mammovan were Eduardo M. Sotomayor, MD, director of the GW Cancer Cneter; Robert E. Kelly, MD, CEO of the MFA; Kimberly Russo, MS, MBA, CEO and managing director of GW Hospital; Anton Sidawy, MD, MPH ’99, president of the MFA and Lewis B. Saltz Chair and Professor of Surgery at the GW School of Medicine and Health Science (SMHS); and Jeffrey Akman, MD ’81, RESD ’85, vice president for health affairs, Walter A. Bloedorn Professor of Administrative Medicine, and dean of SMHS. In addition, WUSA news anchor Andrea Roane presented awards to event honorees EagleBank Foundation, the contributions of which helped make the new mammovan possible; Ellen Sigal, PhD, chair and founder of Friends of Cancer Research; and Blair Watters, senior director of government affairs for InterDigital Communications.